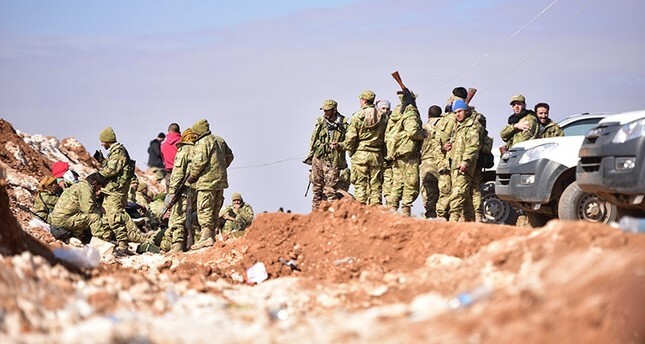 The strategic hills overlooking the northern Syrian town of al-Bab were captured by the Turkey-backed Free Syrian Army (FSA), clashes have resumed for the town's full control, the Turkish military said in a statement on Wednesday. Speaking at a press conference in capital Ankara, Prime Minister Binali Yıldırım said that the FSA have surrounded Al-Bab on all sides and clashes resume for full control of town. He added that coordination with U.S.-led coalition and Russia prevents possible clashes with Assad forces as their troops move closer to al-Bab from southeast. Speaking to the NTV television channel, Kalın said Turkish military forces and the Free Syrian Army (FSA) started to advance from the outskirts of al-Bab into the city center, adding that they are in contact with Russian authorities to avoid any encounter with the Assad regime on the ground. Army units pounded 189 Daesh targets, including shelters, defense positions, command centers and heavy weapons, while airstrikes destroyed 65 Daesh targets, including shelters, checkpoints, tunnel entrances, a headquarter and a technical, the statement added. The statement said 58 terrorists have been killed in clashes, airstrikes and artillery fire. The U.S.-led anti-Daesh coalition also carried out seven airstrikes in the al-Bab region, destroying 10 shelters, a tunnel entrance, a defense position and an armored vehicle. In another statement released later on Wednesday, the military announced that two Turkish soldiers were killed and 15 were wounded in ongoing clashes against the terrorist group, while also noting that the wounded soldiers were immediately taken to the hospital. Meanwhile, Foreign Minister Çavuşoğlu said yesterday that Turkey and other regional powers should provide special forces troops for the eventual assault on Daesh's Syrian stronghold, the city of Raqqa. "We, as the regional countries and the countries in the coalition, can activate our special forces. We should do so," he said in a televised news conference with Saudi Foreign Minister Adel Al-Jubeir. Turkey launched Operation Euphrates Shield on Aug. 26 last year to clear its border area of terrorist groups by supporting the FSA. Following control of the towns of Jarablus and al-Rai, FSA fighters launched an operation to capture Daesh-held al-Bab in early December, reaching the outskirts of the town by late December. Al-Bab is one of the two objectives of Operation Euphrates Shield, with the other being Manbij, which is currently controlled by the Syrian Democratic Forces (SDF) dominated by the PKK's Syrian offshoot, the Democratic Union Party (PYD)'s armed wing, the People's Protection Units (YPG).